A local pub has raised a fantastic £510 for local people with brain injuries following their Christmas draw. 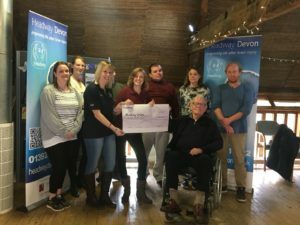 Sarah and Jenny from the Ashill Inn visited Headway Devon’s day centre in Exeter to present the cheque and find out more about the work that the charity does. Headway Devon Fundraiser, Holly Keatings, said “We are delighted to be able to accept this cheque on behalf of local people with brain injuries. We were so pleased to hear that the Ashill Inn had raised so much money and are overwhelmed by the outstanding generosity of the pub and their customers and we would like to offer our most heartfelt thanks for this support.